This hike was somewhat of a disappointment, completely due to weather conditions. 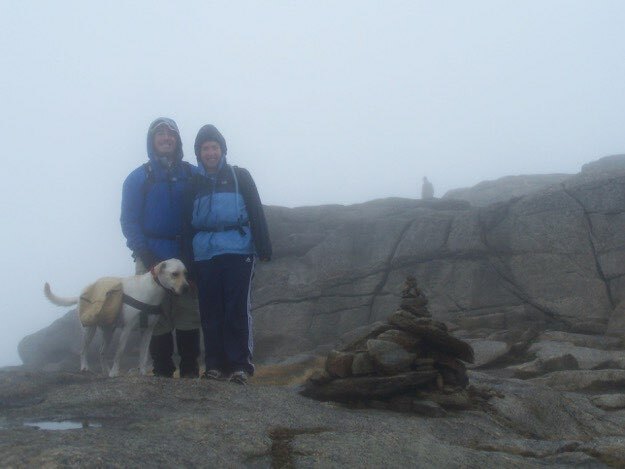 It was raining, and cloudy, (meaning no view), so there was no visual reward for reaching the summit. 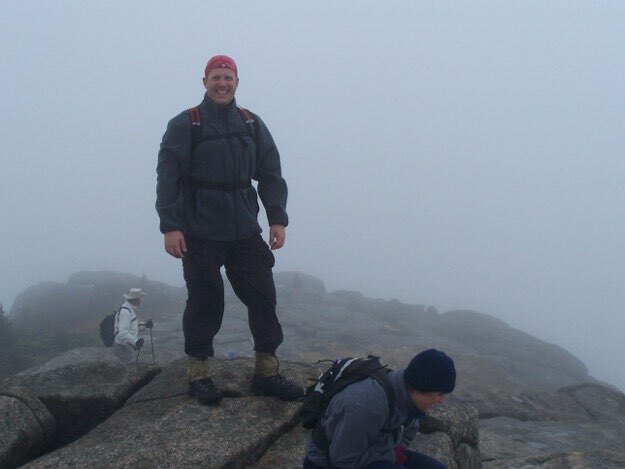 The summit of Cascade was bare, open rock, and would certainly have provided an excellent view all around, had we not been in the clouds. Unfortunately, the wind was so cold and strong, we couldn’t stay up there for long. Why would we, there was nothing but fog all around us anyway?! The hike itself wasn’t strenuous. 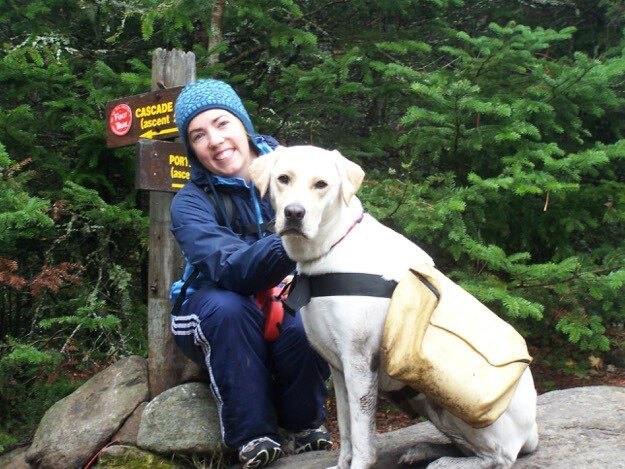 It is family and dog-friendly and is by far the easiest of all the 46 high peaks. 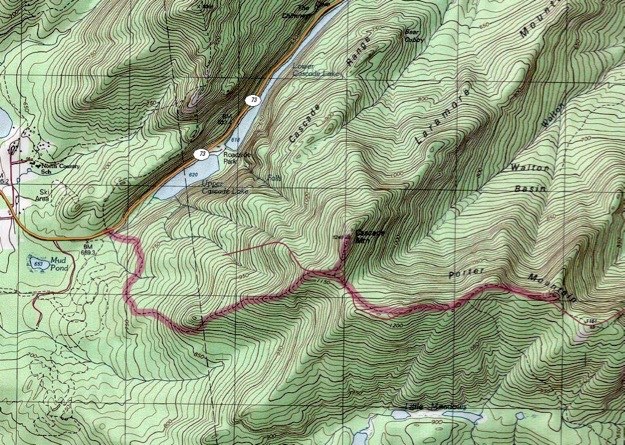 That is partly because the trailhead is very easy to get to, and you begin the climb to the summit immediately, versus having to hike miles in to the interior before even getting to the climb, (like most of the other high peaks). Porter was also a let down due to the clouds and cold rain. 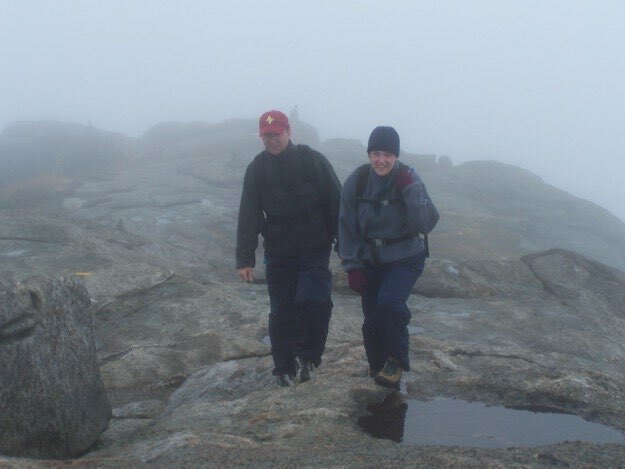 By the time we reached the summit, we were drenched, and getting chilled. The camera stayed packed away. If you must do these two mountains, and you want to get anything out of your efforts, wait for a clear day. Cascade is 36th at 4098 ft., and Porter is 38th at 4059 ft.
Porter’s long ridge on the left leads into Cascade’s pointy summit to the right. 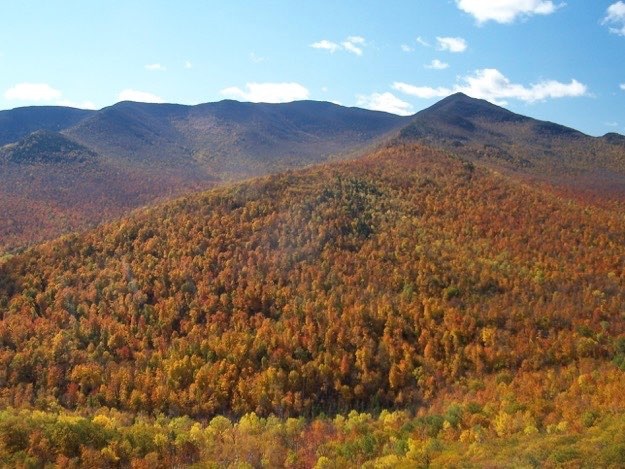 Seen from Owl’s Head of Keene. A nice clearing where the remaining 0.3 miles of trail to Cascade’s summit goes left, and the summit to Porter is 0.7 miles to the right. This sheltered area served as a great lunch spot, out of the wind, with a huge, comparitively dry boulder to sit on. 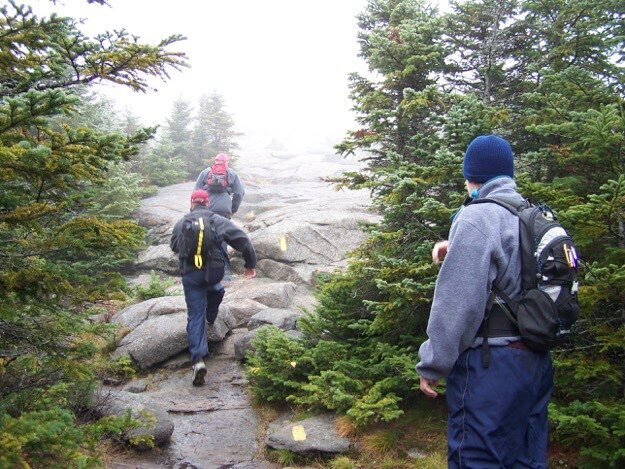 Heading towards the summit of Cascade. 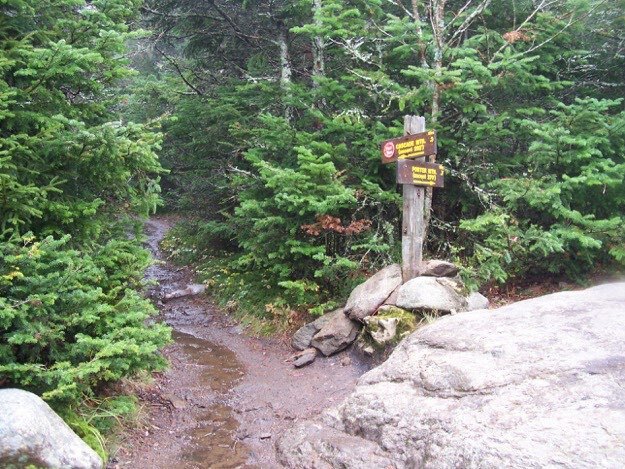 Trail exits the trees, and enters the bare rock phase. 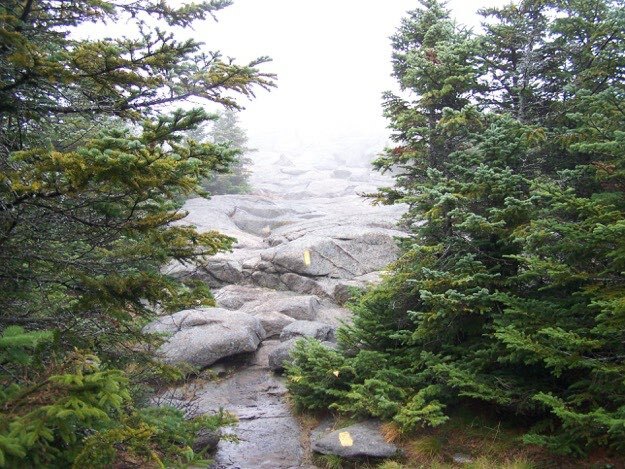 Yellow paint blazes and rock cairns help guide the way in low-visibility conditions like these. My friends Andy, Matt and Laurie begin the final ascent to the summit. Matt and Laurie just steps away! Andy and Laurie at the peak. 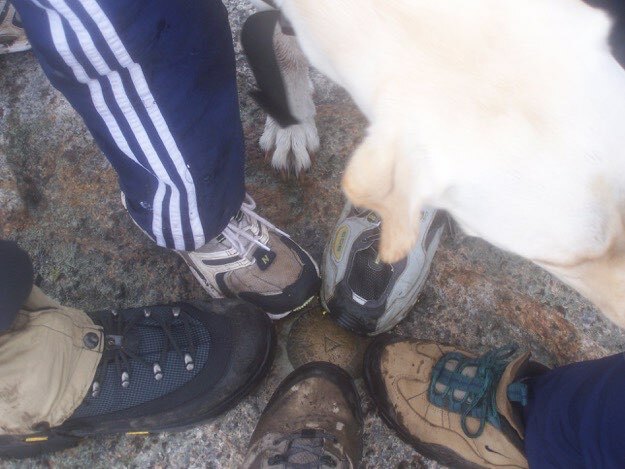 Everyone in our hiking party, (even my dog Molly), gathers for the summit marker foot photograph, to prove we made it. Molly, myself and Jen pose just below the summit, (out of the high winds a bit). Jen and Molly back at the clearing, just before the boys go on to tackle Porter. NOTE: Again, sorry about the lack of pictures. It really rained heavily during our Porter hike, and because of that, we don’t even have any pictures.